Your tools look awesome. Thank you for providing them to the community. When you use this awesome tool – thanks Claus! – you might be in the situation where your clone files have the postfix ” Clone.fmp12″. Instead of renaming them one by one, select them all in the Finder and choose “Rename Items…” from the contextual mouse menu. This lets you replace ” Clone” by nothing. Thanks for this great tip, Peter! Thank You so much for this migration tool! There must be a newer release of the DMT by FMI, that resolves isues with some special characters in passwords – so, I tried to download Your tool again instead of replacing the DMT manually to avoid some problems in the future..
Is there a way to get the latest version of Your Helper? There is no new version of the tool. If FMI release a new version of DMT, just replace it in the tool. Thank you very much! Very good tool!! Will this work on Widows? Seems like t is missing the Windows FMDataMigration EXE and it seems unable to create the necessary directories. The FMDT is NOT included, as we are not allowed to distribute that tool. 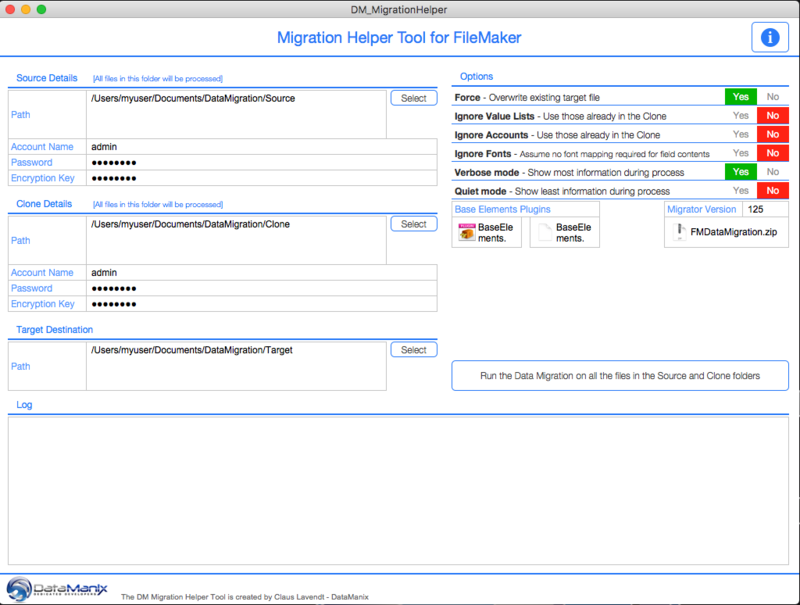 So you need to download that from FileMaker first and then you can include it in the tool. That being said, the tool is currently only built for MAC. However, you can make a few modifications and then it will work on Windows as well. Thanks so much for that tool! Very helpful, Claus !